This fresh peach cobbler is not only naturally sweet and delicious, it’s the perfect easy homemade peach cobbler recipe to use up those fresh summer peaches. With no refined sugar or flour, this fresh peach cobbler uses real, whole ingredients, and is the perfect sweet treat. Okay, can we just sit and chat for a bit about the yum factor of this fresh peach cobbler? Fresh peaches? Yes. Sweet golden cobbler crust? Yup. Super duper easy recipe? Yeah. Summery sweet goodness? Absolutely. It meets ALL my requirements! If you add fresh peaches, it’s on. There’s really no question for me. Ever. 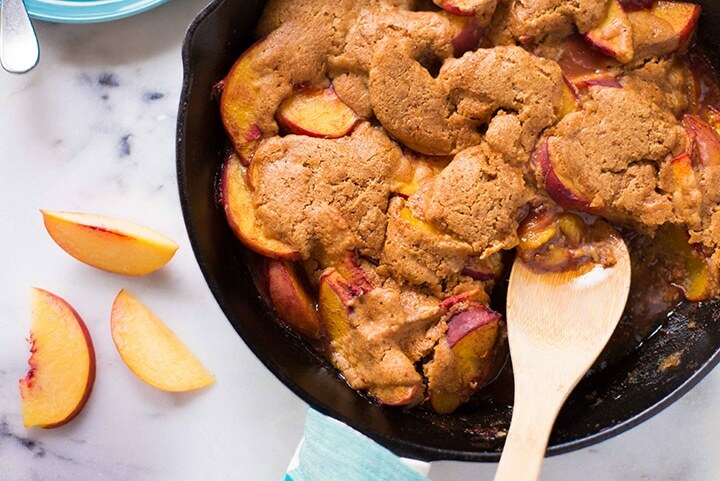 This healthy peach cobbler recipe is super easy. I kid you not. It will take you less than 15 minutes to prepare and likely even less than that to devour – if you’re anything like Dustin and me. Okay, like ME, actually. What’s The Difference Between a Cobbler, Crumble, and Crisp? So first thing’s first: What the heck is the difference between a peach cobbler and a peach crumble and a peach crisp and…? Whuh? And then there’s also a peach buckle! What the heck? Believe it or not, these all exist…kinda. Let’s get this all straightened out for good. Cobbler: This consists of baked fruit that is topped with a batter or biscuit crust. The topping is often “cobbled,” rather than smooth since it is usually dropped or spooned in small clumps over the fruit, allowing yummy bits of the filling to show through. Think cobblestone, only fluffy and biscuity and over deliciously baked fruit. You can see in the images of this fresh peach cobbler to see exactly what that looks like. Crisp: This consists of baked fruit that is topped with a combination of flour, nuts, oats, butter, and sugar. The crumble topping is more like a streusel or granola, and usually completely covers the fruit. This is also sometimes called a crumble because of how the topping crumbles. Buckle: Just for fun, I’m including a buckle in these definitions. One – because it’s hilarious to me how many different ways you can dress up baked peaches with flour. Two – because maybe you also might want to know the difference. Three – because it’s called a buckle. A buckle is a fruitcake, usually made with blueberries, and the top looks buckled. Believe it or not, this dessert is also sometimes called a crumble. Don’t ask me why, but it is. Wanting to make a healthy peach cobbler recipe? Yes, it’s totally possible to make peach cobbler healthy. No, it’s not usually healthy when you order it at restaurants. Your typical peach cobbler will contain all-purpose flour, butter, white sugar, and possibly other highly processed ingredients. Tasty, yes. Nutritious? Not so much. Let’s replace all those unhealthy, processed ingredients with nutrient-dense, better-for-you whole ingredients – shall we? So, how do you make homemade peach cobbler healthy and delicious? First, we can replace the all purpose flour with whole wheat pastry flour. 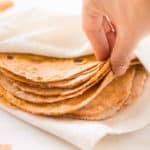 If you can’t find whole wheat pastry flour, you can sub with another unrefined and nutritious flour, like oat flour, spelt flour, buckwheat flour, or regular whole wheat flour. 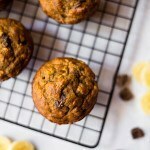 Personally, I like the flavor and texture of the whole wheat pastry flour for this recipe, but any of those would work. Next, we can replace the butter. While unsalted, organic, grass-fed butter is actually a clean ingredient (crazy, right?! ), I still like to stick with coconut oil as a better replacement for butter. The coconut flour has a natural sweetness to it as well, which reduces the need for additional sugar. Treat the coconut oil just as you would butter to harden it and then break it into pea-sized bits before adding to the cobbler batter. Finally, we can replace the usual white or brown sugar with coconut sugar. Coconut sugar is a nutritious sweetener and has a low score on the glycemic index (which essentially means it doesn’t tax your body and make you crash after giving you a sugar rush). Coconut sugar tastes similar to brown sugar, but slightly richer. You can learn more about coconut sugar in this post. That all being said, we can really stand to remove A LOT of the sugar that is usually added to a peach cobbler. 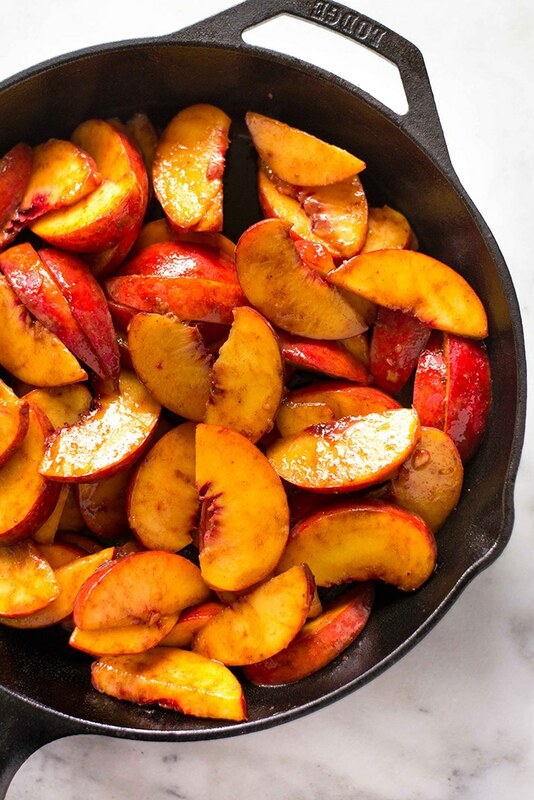 We’re cooking with mainly peaches here which are nice and sweet, especially during the summer when they’re ripe so there shouldn’t be a need to drown it in sugar anyways. 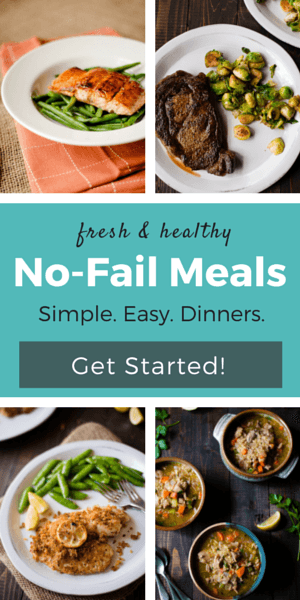 Overall, luckily, this recipe is pretty easy to make healthy and tastes just as good. While you’ll probably want to polish off this whole fresh peach cobbler right out of the oven, chances are you’ll need to store some leftovers. The last thing you’ll want to do is store it in a way that makes it super mushy and gross when you eagerly go to grab it out of the fridge the next day. So here are some tips for how to store homemade fresh peach cobbler so it stays as fresh, tasty, and cobblery as possible. Cover the peach cobbler lightly with plastic wrap. Do not wrap it too tightly, in order to avoid any damage to the biscuit topping. Store the fresh peach cobbler in your refrigerator on a flat surface so nothing leaks out. You can also store peach cobbler at room temperature on the counter, covered with tin foil. Keep the peach cobbler in the refrigerator for no longer than one week. Reheat your peach cobbler in a preheated oven at 375 degrees Fahrenheit until heated through. If freezing your peach cobbler, bake completely before freezing. Allow the peach cobbler to completely cool before covering with plastic wrap and refrigerating or freezing to avoid trapping added moisture. Depending on the variety, peaches can ripen from May to early August here in Dallas and generally North Texas. You know what that means?? NOW is the best time look for them at your local farmer’s markets or — even better — go pick them yourself at a local farm <— LOVE. Fresh local peaches are large, juicy, sweet, and their pit almost falls out with a slight twist of the wrist. Perfect for making wholesome, fresh peach cobbler. Okay, so now you’ve got all the information you need to grab those amazingly delicious fresh summer peaches and make yourself some homemade healthy peach cobbler. 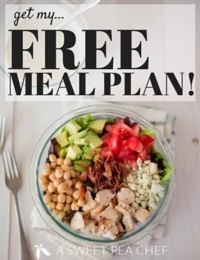 Since it’s so easy to make, go ahead and make a second one at freeze it for later, too! Slice the peaches into about 1/4-inch thick slices. We want them to be relatively thick so they hold up when baked. No need to remove the skin. 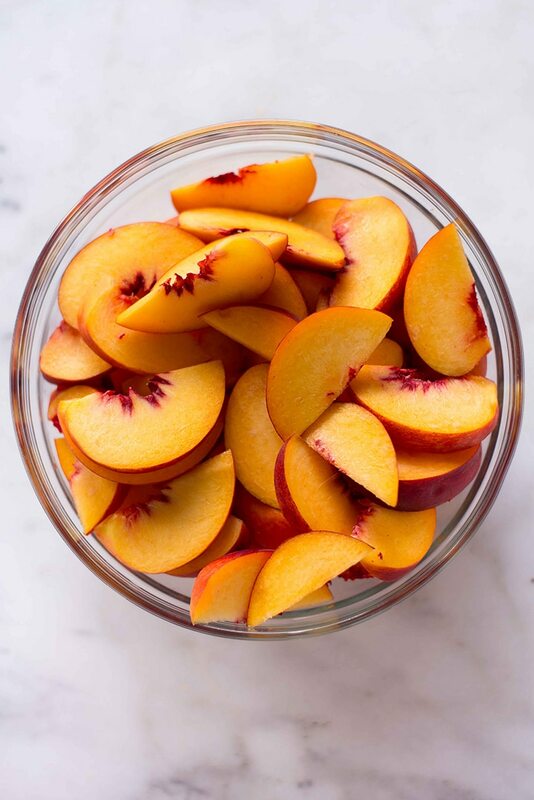 In a large mixing bowl, add the sliced peaches, arrowroot starch, cinnamon, coconut sugar, lemon zest, lemon juice, nutmeg, and vanilla extract and toss until completely combined and the arrowroot is dissolved. Pour this filling into a cast iron skillet or a greased baking dish, and set aside. To prepare the biscuit cobbler topping, in a large bowl, add whole wheat pastry flour, almond meal, coconut sugar, baking powder, and sea salt, and stir to combine. Add unsweetened almond milk and stir until just combined. It’s okay that the batter is slightly lumpy. 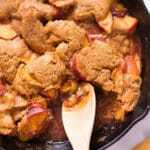 In heaping tablespoons, drop the batter over the sliced peach mixture in the cast iron skillet. Place into the oven and bake until the cobbler topping is golden brown, about 20-25 minutes. * If you don’t have access to whole wheat pastry flour, you can also use whole wheat flour, buckwheat flour, oat flour, or spelt flour. Could I have your original peach cobbler recipe? My husband who says he doesn’t like peaches loved loved loved that recipe!!!! Thank you!!!! PLEASE bring back your original peach cobbler recipe, even if you need to post it on a different link! I can’t have any of the substitute ingredients here due to almond and coconut allergies!! Thank you! Instead of almond flour, you can use additional whole wheat pastry flour and instead of the coconut sugar, you can use date sugar. I hope that helps! I don’t use anything coconut. What could I substitute in the peach cobbler recipe? For wet ingredients, you could replace with raw honey or pure maple syrup and for dry ingredients, you could replace with date sugar. Where’s your original recipe? I’m glad you’ve made a “healthy” version, but I much prefer the original recipe you had. You may have answered this already, but is it okay to use skim milk in this recipe? It’s what I have on hand! This looks amazing, however I have an allergy to cinnamon. What would you suggest I use in it’s place? More nutmeg? Ginger? Thank you! I’ve read you can substitute with 1/4 of the amount of either nutmeg or allspice. Good luck! I picked this to make at a friends cabin a couple of weeks ago. She has a crazy old oven that initially charred the top, then we added foil and cooked for a longer time at a lower temp. It was AMAZING… char and all. 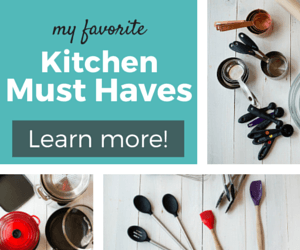 Very simple and I love the format of your site. I’ll be spreading the word! Darn it, I missed the part where you said cook the peach mixture and just dumped it on top. It’s in the oven now with a pan underneath it to catch the inevitable drips. Those peaches were juicy!!! Oh well. Thanks so much for sharing this. 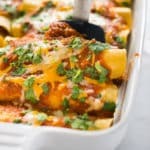 I came across it on Foodgawker and made it last night. It was so easy and turned out exactly like the picture. I love how it cooks up and around the peaches. It reminds me of the cake pudding my mom used to make – cakey, gooey, and not too sweet. I served it to overnight guests who insisted on eating the leftovers for breakfast…with ice cream of course! What an amazing breakfast this would be!! Love that idea. Super yummy! Family hit! I cut sugar to 1 cup and butter to 3/4 cube. Our peaches were already sweet and I’m always looking for ways to cut some fat but keep good taste. It was delish!! I live in Anchorage Ak and there is only one place in town that has great tasting fresh peaches this time of year. I paid $2.49 a lb for the peaches and I found your peach cobbler recipe. It was fantastic and it looked just like your photo. Thanks so much. 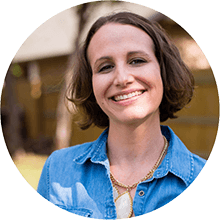 I stumbled upon your blog today while searching for a recipe for fresh peaches… WOW!!! That sums up my feelings about this recipes!! It took less than 15 minutes of prep time and that included clean up! Thank you so much for sharing… My whole family enjoyed it! Thanks for sharing the recipe! I made it tonight and it was delicious:) It was very sweet even with less sugar still very very good. Cant believe I waited this long to make peach cobbler. Its so easy! Yay, so glad you enjoyed it!!! About how many people does this serve? I’d love to take it to work, but 4 peaches just doesn’t seem like a lot at all! Believe it or not, this recipe serves about 4-5 easily. But feel free to double the recipe for the peaches and innards, but the top will likely remain the same. Enjoy! Got the lemon, and we are eating it now. YUM!!!! Thank you! I substituted a vegan shortening for sugar in one of them (I made two) for my vegan husband. Worked fine. Hi Lacey! Made your cobbler last year with peaches from our yard and just made it again this year too! Question for you: will this recipe work with frozen peaches as well? We have a ton of peaches from our tree this year and are thinking of freezing them in slices. Thanks!! Hi Mary Ann! I’m soooo jealous of all your fresh peaches! I’ve never tried freezing peaches for this cobbler recipe, but I’d bet you’d be fine, since peaches lose much of their consistency anyway when cooked. 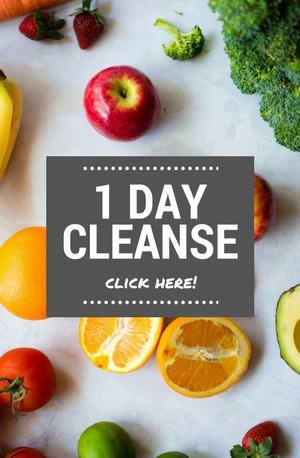 If you try it out, I’d love to know how it turns out for you! Looking at foodgawker and came across your recipe. Looks great and am making right now as I just visited a peach orchard this morning and am craving this peach cobbler. Thanks for posting! Hi Lacey! Just found your website while searching for a great peach cobbler recipe. Yours sounds fantastic! One question; I was going to blanche ( I think that’s what it’s called?) the peaches to remove the skins. Just curious what your take was on that and why you chose to keep the skins on. I’m all about whole foods but I wanted to make sure I didn’t have a bunch of tough skins mixed in. Ok, make that two questions; have you considered using brown sugar for the cobbler part? Why or why not? I love to bake and I love to learn different techniques! Great name BTW!!! My main reason for not blanching the peaches is laziness that I just don’t mind the skin at all. But feel free to remove the skins if you’d prefer. As for the brown sugar, I’ve wondered the same thing about this recipe. I tend to use brown sugar over white sugar, but this recipe comes out perfect with the white sugar and I haven’t messed with it (it’s not originally my recipe). If you do try the brown sugar, I’d love to know how it turns out for you! 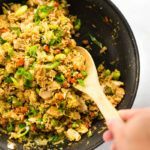 What are the calories in your recipes? Thanks for this wonderful peach cobbler recipe, I just found your site and can’t believe the great recipes you have! I must try this one….can of course come back for more, my hubby will love it! I’m so excited! Peaches are super on sale right now, so I picked up a bunch earlier and didn’t know what to do with them until I found your blog on foodgawker. I just put my cobbler in the oven and I CAN’T WAIT until it’s done! I’m an aspiring baker/chef, please check out my website at kelseysillustrated.wordpress.com! Hi Kelsey! Yay – gotta love when peaches are on sale. I hope you enjoy the cobbler and thanks for the link back to my site! Good luck with your baker/chef aspirations!! If I needed another reason to look forward to summer, this is it! Thanks for retweeting this today. I’ve clipped it and have it ready for summer. New Jersey peaches are THE BEST. Thanks so much, Meredith! Just checked out your site….it looks great! See ya around! This looks so fresh and wonderful!! I’d totally drop a dollop of vanilla bean ice cream on top.. yum! I call my girlfriend my sweet pea …we found your site on foodgawker after getting a case of peaches and it was as though the universe was telling us THIS IS IT!! She made this for me and it was fantastic. LACEY!!!! Oh my gosh. That was SO delicious. We used store-bought ice cream (but I did order an ice cream maker that comes next week) but that didn’t make it any less yummy!! I am definitely going to have to increase my time at the gym. your peaches are so beautiful and the peach cobbler looks delicious!! 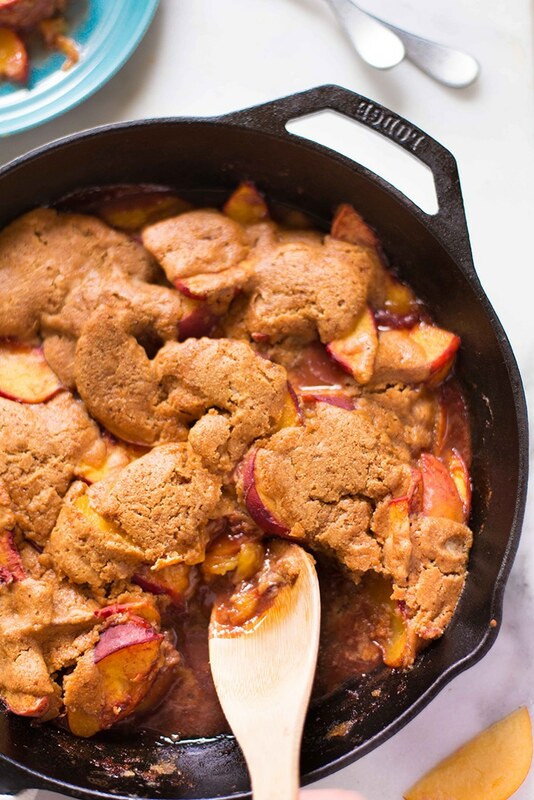 I love a good cobbler / crisp….and the peaches lately have just been heavenly! What a great dessert! Yay, Joann, that’s great everyone loved it! It certainly looks like a lot of sugar in the recipe. I even decreased the amount from the original recipe after I made it because I felt it was a little too sweet. I’m glad you feel the same way. I have never made a peach cobbler either but you’ve convinced me that I need to!! Why have I never made peach cobbler either?!?!?!? This preposterous. I need to get to the kitchen. Haha, Joanne! I’m so glad I wasn’t the only one. Wait — now you are the only one! Quick! Make it soon so you are no longer left out 🙂 Heehee. Thanks for stopping by! First off ~ I made the fish tacos and they were delicious! I loved the flavor combination of the pico de gallo, the dill sauce, and the fish with the spicy breading. Yummy meal, even my husband liked them and I was skeptical about that. That recipe is definitely a keeper! I have a few ripe peaches sitting in the fruit bowl and they are headed for the peach cobbler this morning. Thanks for sharing these delicious offerings. I hope you like the Peach Cobbler as well. Take care! Lacey: Before I try this yummy-looking recipe, I have two questions. First, I typically use self-rising flour. What are your thoughts on that? Second, do you have a recommendation for an ice cream maker? We’re going on vacation soon with the family, and it might be a good thing to have on hand. (1) I’m not too familiar with self-rising flour, unfortunately. However, I know it has 1 1/2 tsp. baking powder and 1/2 tsp. salt to 1 cup flour. The Peach Cobbler recipe calls for a whole tbsp. of baking powder, however. So, you could either just try it “as-is,” or try to add another 1 1/2 tsp. baking powder. Does that make sense? I’m sorry I don’t have a better answer than that. If you do try it out, would you please let me know how it goes so I can better answer this question in the future? I hope this helps you out. Good luck! I made this cobbler and missed the all-purpose flour note – just inserted self rising. I don’t know how the ap flour cobbler looks, but mine turned out great! Beautiful appearance and good fresh peach taste. I will always use self-rising flour in this recipe from now on. This is now my go-to cobbler recipe! Mmmm this has me drooling thinking of how good this would taste!! Delicious! I love peaches and definitely can’t wait for them to come back into season here.